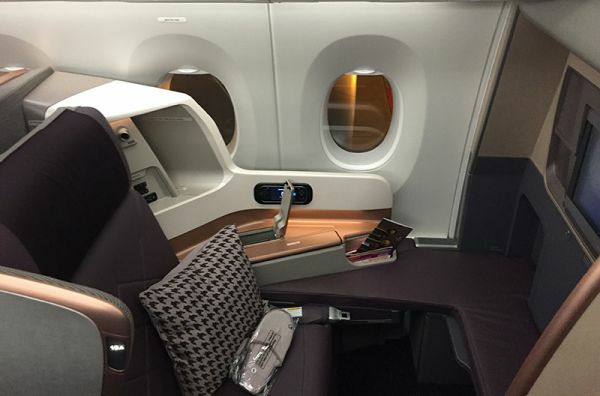 Reportedly the passenger experience is substantially better on the new A350 ultra long-haul jets. 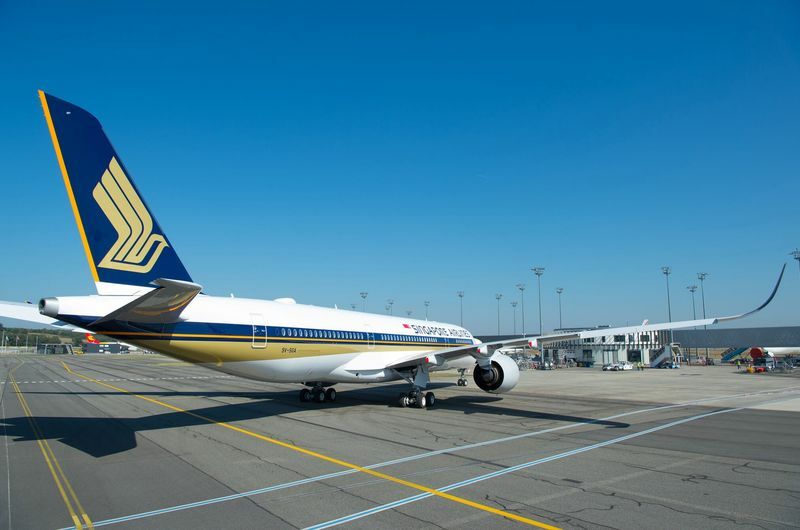 What did Betty Wong, VP Inflight Services at Singapore Airlines (SIA), actually promise? "You will leave the aircraft happy, smiling and refreshed and you will not feel that it took 19 hours to get to your destination." Can that be true, can an aircraft actually be a wellness machine? I wanted to find out for myself exactly one week after the first flight had left on October 11, 2018. Changi Airport Singapore, Thursday shortly after 11pm local time, boarding for the world’s longest flight at gate B4. It is the first commercial flight tonight for our aircraft, though 9V-SGA had been delivered first, but still initially only the second A350-900ULR 9V-SGB was operating. Since after a five-year hiatus the nonstop route has been taken up again it is the only one in the world bridging over 15.000 km in one stretch, depending on the route chosen it could even be much more than 16.000 km. Same as in the A340-500 then, today again the cabin of the A350-900ULR just offers two classes, with now 67 seats in Business Class, a number which has only slightly changed, while current standards in Premium Economy have risen so much that now just 94 seats are installed (versus 117), in a 2-4-2 configuration with 38’’ (96.5 cm) pitch. A total of only 161 seats in both premium classes are available in this ultra long-haul jet, while double that would be possible. At flying times of over 18 hours IFE becomes even more important. A quantum leap also here: In 2004 the A340-500 had about 400 different audio and video programs available on demand. Today SIA has stocked up the standard 1.000 hours of stored content with another 200 extra hours. You’d have to fly more than 60 times to see it all. It was a deliberate decision to leave out regular Economy Class, its tightness would have hardly been bearable for 18 hours. Tonight on SQ22 however, not even half of all 94 Premium Economy seats are taken. The best of which are the three single window seats on each side in rows 40 to 42, seats A and K.
Beneath the window they all come with a box to store things and offer a very good place to put items on top, too. In contrast, Business Class in the front is almost booked out, its cabin product is almost 100% the same as offered on regular SIA A350 flights. Meaning it is positioned between the old A380 product (currently still on the Frankfurt route) and the new A380 seats (currently already on the Zurich route). The problem of almost all SIA Business Class seats is the tight foot space, at least for tall guys like me, and the need to sleep diagonally with the bed extended. That’s why I always try to secure a bulkhead seat. Those in the centre of the cabin offer the fullest foot space and one can stretch out straight, at the windows behind partitions there is a bit less room for the feet than in the middle but still more than elsewhere. Best seats for single travellers are 10A and 11K, the first ones on both sides in the front of the aircraft, where foot space is biggest. On seats 19A and 19K in front of the second cabin there is slightly less space to stretch out, with a foot well in the wall on the outward side. I am seated on 19A and content with it for this long flight. For me, having a window seat is always a priority. Especially on this flight, though there will be only about five daylight hours. Still: I want to be my own master of lighting and views. I can’t understand that on this and most other long haul flights the majority of passengers generally leave their window blinds shut tight and prefer to sit or lie in darkness for up to 18 hours. Exactly at 11.51pm local time SQ22 lifts off from the runway at Changi heavily loaded with, take-off weight is almost 280 tons. It could be a record flight: “Estimated flight time is 17 hours sharp”, said the Captain before, much quicker than usual, block time is 18:25. On the screen the flight route appears – from Southeast Asia over China and Russia almost straight to the North Pole, passing Greenland to New York. This would be the straightest so-called grand circle route, measuring 15.345 km. But SQ22 takes another route: Over the North Pacific, leaving Japan off to the left, then Kamchatka and over Alaska before crossing North America towards the US East coast, a distance of about 16.500 km. This is where the strong jet stream gives the aircraft a welcome tailwind of up to 200 km/h at some points, pushing the speed over ground to more than 1.100 km/h. But also 17 hours can be endless. How does one spend them best as a passenger? Most experts advise to sleep early and late into the flight, at least if one wants to be alert when arriving in New York in the early morning. 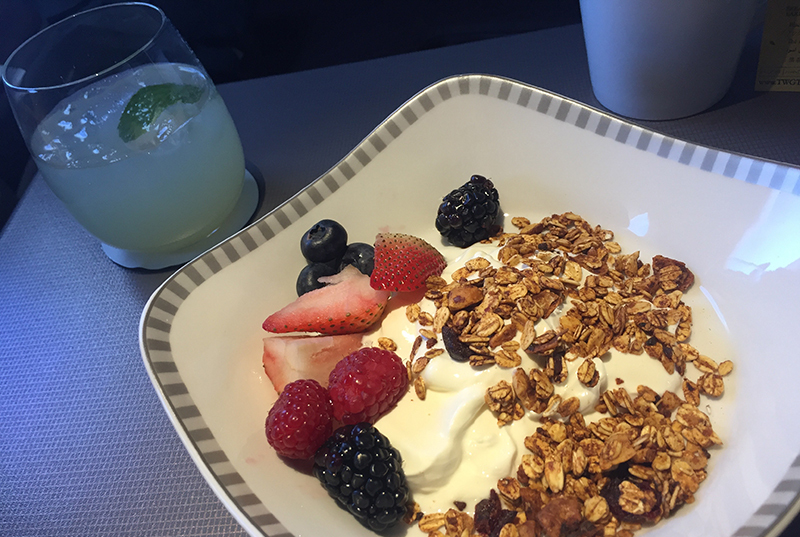 The meals, some co-developed by an American wellness company, are designed to bring some structure to the flight as well. A graphic in the printed inflight menu tries to describe the sequence of service: Between one and three hours after take-off the first food is offered, the second menu mid-flight, some time between eight and 16 hours after take-off, while at the same time it is declared that on demand meals can be served anytime. Between the third and 16th flight hour there is also an array of smaller dishes available á la carte. That’s the theory. Most passengers fall asleep soon after departure in any case. 90 minutes after take-off, in the middle of the night, the first meal arrives, three options in the back and four in the front of the cabin. In Business the choice comprises of Snapper Fillet with Red (!) Wine Sauce, Beef Hor Fun, Croque Monsieur or Lobster Dumplings in Soup. I opt for the latter and find it very tasty. Accompanied by my new favourite drink: Agave Lemonade with fresh lemons and ginger. Yummy, sour, spicy, refreshing – and created just for this flight. I could drink it by the litre, ever since I tasted it for the first time before take-off. I am restricting alcohol on this flight to an absolute minimum, in total one glass of champagne and one miniature bottle of Japanese sake. In contrast to the inaugural flight a week earlier, tonight Wifi works flawless and fast. Business passengers get 30MB for free, a tiny amount of data often used up in minutes. 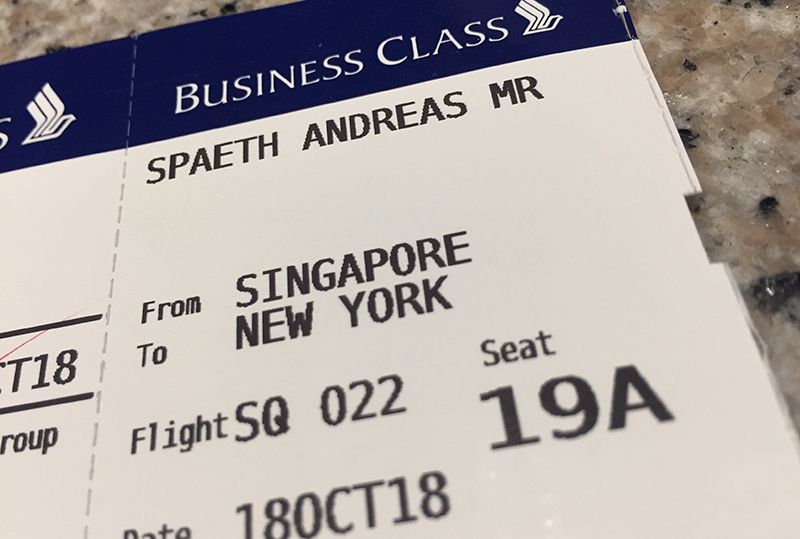 I am given 200MB tonight, the amount SIA’s First Class guests normally get – and that’s indeed enough to post time and again or check e-mail, I can’t even use it up fully before arrival. Now I sleep for a few hours, on the A350 the seat easily slides into the vertical position to become a bed, whereas on the old A380 it still has to be turned upside down by hand. The area to lie down offered here in front of the partition is substantially greater than on the other seats. Unfortunately SIA doesn’t offer pyjamas even on this flight, but I came prepared and brought pyjama pants from another flight and don a T-shirt with it, a perfect outfit for the long flight. Usually SIA doesn’t hand out amenity kits in Business Class, something I never completely understood. But here, just as almost everybody sleeps two and a half hours after take-off, the crew all of a sudden distributes black fake-leather amenity bags. Their content appears a bit random: Besides useful things the most voluminous items are a soap that removes stains and a “crease release” spray to remove wrinkles in clothing. That’s about least needed right here and now, I find. As I wake up again we have passed Japan after seven and a half hours flight, outside it’s day while in the cabin constant darkness reigns. It feels like breakfast time, but there is no breakfast menu. But then, a Greek Yoghurt and Granola Parfait with fresh berries fit the bill perfectly. Nine hours after take-off the cabin is glowing in soft orange mood lighting and the main meal service begins with the famous SIA satay. But somehow the cabin crew doesn’t deliver a swift performance tonight. Carrying out food or drink orders takes an inappropriately long time, then they claim menu options from the card are not available or they don’t clearly communicate what’s available and what’s not. Usually SIA excels with spotless service, but here there is definitely room for improvement. A frequent flier from Jakarta is right in expressing his dissatisfaction to the purser. Passengers who order food later, as offered, also report lengthy delays, mixed up orders and missing options. Even with the regular food service it takes almost an hour after the satay before the appetizer (crab salad, no choices) arrives. 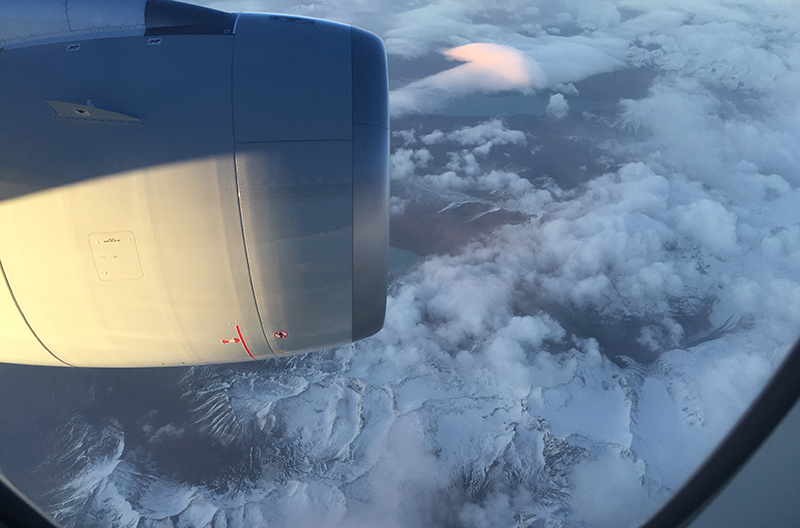 The Airbus already passes overhead the Aleutian islands and until the main course, anyone who dares to briefly open the window blind is treated to a short brief sunset over Alaska. 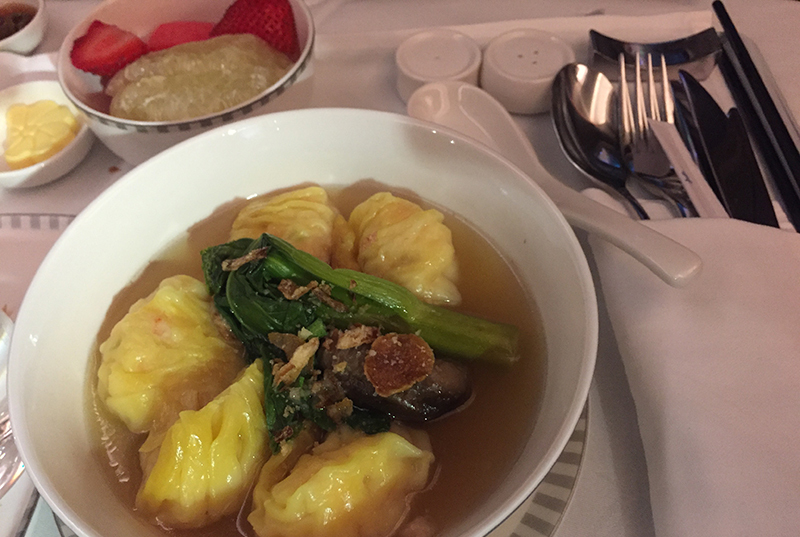 For mains there are six options: Beef Cheek, Pork Shoulder, Chicken Rice, Seafood Noodles (my choice, a solid one), Omelette or Dim Sum. The Mango Cheesecake for dessert is a bit tasteless, but then pralines make up for it. Still six hours to New York, and time again to sleep. It’s clear already: Never before ultra long-haul flying has been so comfortable as in an A350. The lower cabin altitude and remarkably fresher cabin air in this new aircraft mean a quantum leap in wellbeing on an extremely long flight. We haven’t even reached the 17-hour mark yet as on the left side the illuminated silhouette of Manhattan appears. At the ungodly morning hour of 4.41am Eastern Standard Time SQ22 touches down in Newark early Friday morning. And it broke the record: No other scheduled flight before has made it from the southern tip of Asia to New York’s skyscrapers in just 16 hours and 50 minutes. And it’s never this empty at immigration in Newark otherwise. At least now some passengers have the smile on their lips that Betty Wong had promised. The vastly improved cabin atmosphere on the A350 makes even an 17- or 18-hour flight very bearable, thanks to the higher cabin pressure and better cabin air. Surprising how otherwise perfect SIA had to battle with profound service problems on the tested flight. Once they are overcome the longest flight in the world becomes a viable and surprisingly comfortable option.